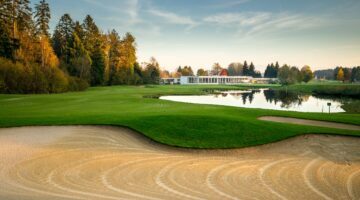 This well-maintained 18-hole course is located on a hill in the Zurich Oberland. It overlooks the lakes Pfäffikersee and Greifensee, and is surrounded by mature trees, streams and lakes, all in a contoured terrain. 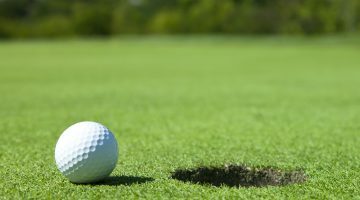 Because of the many obstacles along the course, accurate shots and a defensive game strategy are both required. Hole 15, with its par 3 rating and embedded in a forest clearing, is one of the highlights of the course and leaves a lasting impression. 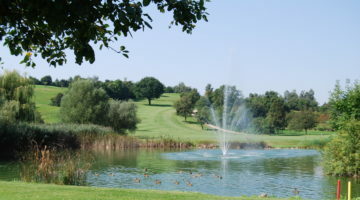 Why not take the challenge of a round of golf on this course that has a beautiful natural landscape as a bonus? Visitors with ASG, ASGI or Migros Golf membership are welcome on weekdays. Guests of GCCH members are also eligible to play on weekends and holidays. Handicap limit 36 for visitors, 54 for guests. Play entitlement limited to 3 times a year.